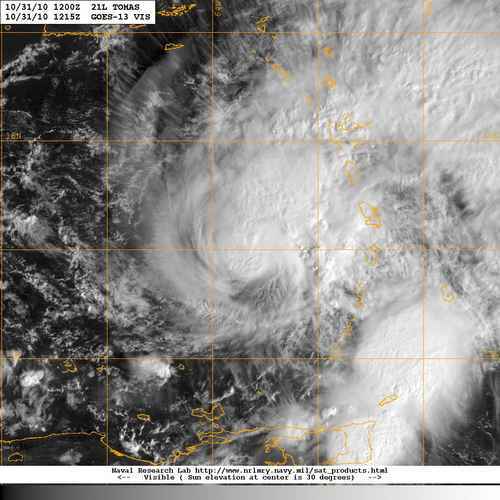 31 October 2010 – All hollows eve day – Hurricane TOMAS now a category 2 tropical cylone is showing signs of further strengthening as it begins to come under the influence of several factors that will affect its trajectory for the next several days: southwesterly wind shear, a front that has come down all the way to the southern Gulf and the Florida straights moving toward the east, and other atmospheric factors have caused Tomas’s track to shift northward and are expected to eventually cause it to start a turn toward the north while also slowing down its forward progress. The projected net result is a hurricane that may come closer to the Antilles, must probably Hispaniola (Haiti), Jamaica and southeastern Cuba, but which may then veer once again toward the northwest perhaps toward the end of the week and at that point the Yucatan Peninsula, the Gulf and even Florida would all become potential targets, but the degree of uncertainty so far ahead is so large that any forecast would be quite speculative at this time. GOES satellite view of hurricane Tomas, on 31 October 2010 at 0745 EST, showing waver vapor in the atmosphere, which helps visualize the atmosferic factors currently affecting the system's trajectory. At present all interests in the Caribbean basin must monitor TOMAS’ progress carefully over the next few days and remain on alert for possible activation of emergency preparedness plans. 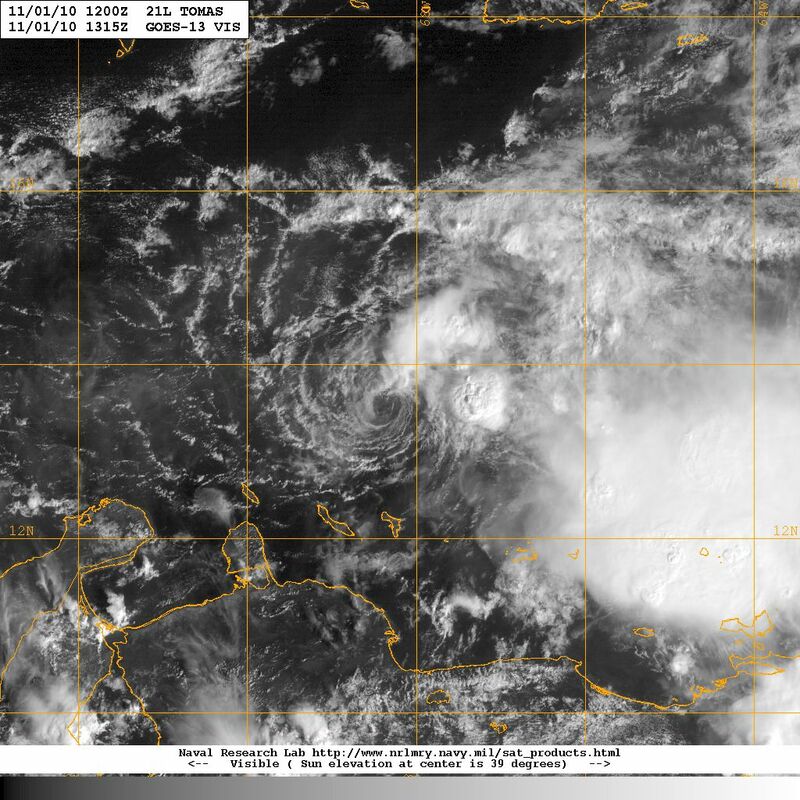 GOES satellite image of tropical cyclone TOMAS on 11 November 2010 at 0915 EST. Notice how the heavy rain is located far to the west of the center of circulation. In this view Tomas was located half-way between the southern coast of Puerto Rico and Caracas, Venezuela moving west by northwest. Tropical cyclone TOMAS has weakened considerably over the past 12 hours under the impact of westerly wind shear and the front that has descended into the northwestern Caribbean. The net result of these external factors acting upon Tomas is that we now have Tropical Storm TOMAS with sustained winds of 50 mph (80 kph) still moving west by northwest, but also being pushed toward the north. The center of circulation is some 100 miles west of the heaviest rain/storm bands. All of this has increased the degree of uncertainty considerably making it quite difficult to accurately forecast future progress and development of this tropical cyclone, consequently both the projected track and intensity over the next 24 -120 hours may have to be continuously adjusted over the next couple of days. Currently the forecast is for Tomas to turn north and go over Hispaniola to emerge over the Atlantic and the eastern Bahamas toward the end of this week, after that there is little agreement between the various models, with some predictiong a turn toward the northwest (the USA) and others toward the northeast and the open waters of the Atlantic. The same degree of high uncertanty also applies to intensity forecasts, where the consensus appears to call for some strengthening in 4-5 days, but with wide disparity among the projected maximum sustained winds. Projected track for tropical cyclone Tomas as of 1 November 2010. The degree of uncertainty for days 3 - 5 is high. All in all it would appear the only thing certain about Tomas is how uncertain its future progress and intensity really are. We’ll just have to monitor this system closely to see what happens. In the mean time we should also keep an eye toward the east where a tropical wave appears to be growing ovwe Hurricane Alley! 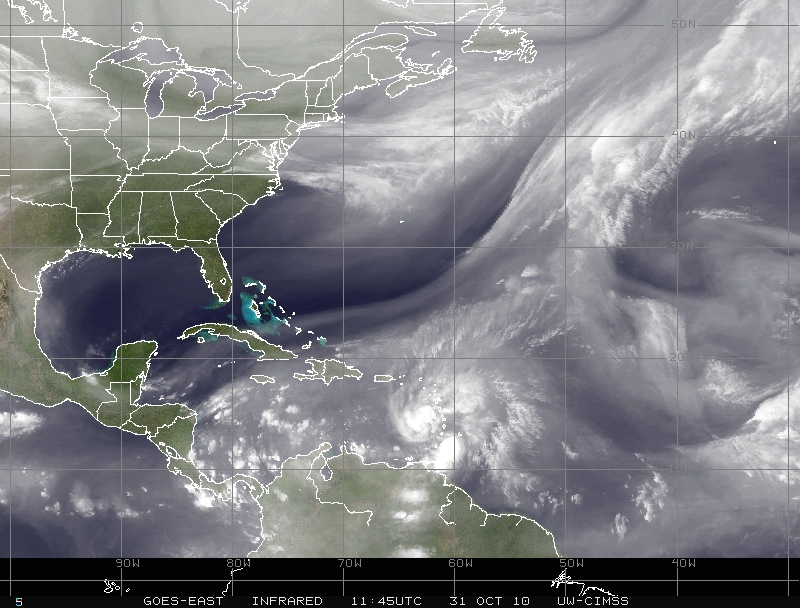 Atlantic-wide satellite view for the aviation industry on 1 November 2010 showing now Tropical Storm Tomas under the impact of westerly shear, and a tropical wave mobing along in Hurricane Alley.